We launch our new partnership with Slinky with this stunning two track E.P. from Matthew Dunne. First up is Punch, and it delivers exactly that, as the menacing kick drum intro gives way to its melodic breakdown and gritty lead riff. Something Similar,Very Different is an equally superb tech trance groover that seemlessly blends some gorgeous deep bass squelch action with melodic stabs, pads and hits that combine perfectly to bring out the lush peak time riff. Both tracks ooze class on every level as Slinky continues to deliver some of the very best in underground trance. 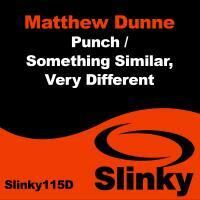 'Punch / Something Similar, Very Different' is available now from Beatport and iTunes.